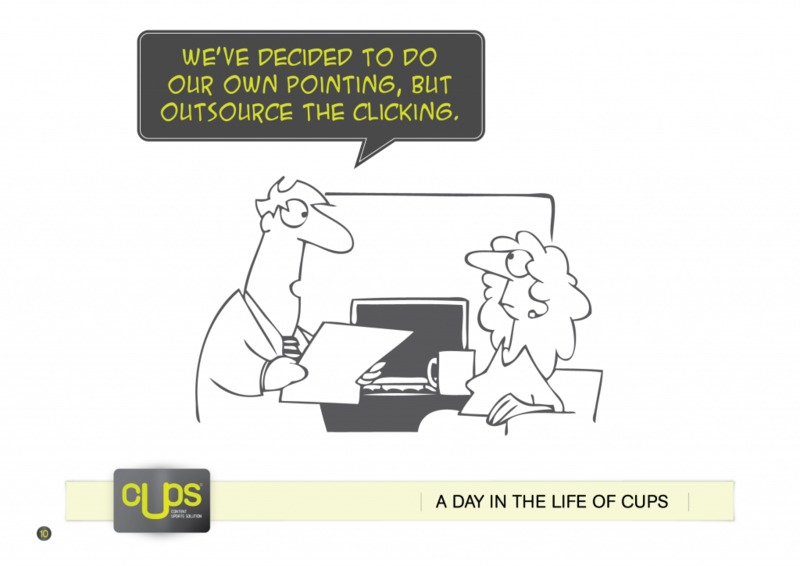 Keep your websites relevant with CUPS affordable Content UPdate Solution. CUPS launched in the spring of 2014. We offer a selection of monthly paid affordable 1 year contracts. Creative Room also offer short term 3 month CUPS contracts. Single contracts for one-off or special projects can also be undertaken for you. In the market for App and Website Maintenance? This could be just what you need! Our business user packages tend to be from Bronze upwards and cost just £67 per month + VAT. Many website and digital agencies attempt to sell customers expensive poorly understood offerings that have not ever been proven. Due to new technologies being developed, be careful what you decide on now, it could already be obsolete! There has to be a multi-dimesional approach. We believe that our service is a more balanced option. We visit you in person monthly* to keep the account in good shape. *Gold CUPS upwards. Keep updated with our articles on our company Linkedin page. Websites should be constantly refreshed. By this we mean nourished with new content, that is pictures and written information. We also mean new links, to provide extra relevant information that visitors want as a source to cross reference our information. This usually ensures visitors will return and look out for subsequent updates. Some companies are easily able to update their own websites. This can organically increase their website visitor numbers. However, there are companies that still remain unable to update their website content due to the perceived complexities involved or there are simply no staff able to do the updates. This leaves their websites with old and stagnant information and dwindling visitors. Updated content is what the better search engines look for. When Google Webmaster Tools is served an updated sitemap to crawl, it recatagorises the pages according to what it finds. This can effect the rank of your webpage in Google search results. It can also reveal the sort of problems than only a large search engine can. The list and rank of the most suitable webpages for any given word search string is the key. This is what makes your webpage have a greater value than others. The result is improved goal statistics within your Google Analytics. CUPS can carry out existing website maintenance to help you get to this level and help your marketing activities to work better. Business Guide for people who know little about websites What is a web session? It’s the time we actually spend working inside your website. Will my website updates be handled only by you? Yes, and no one else but our employees. How long will my web session take? It’s not necessarily the time factor but what’s achieved in that time. However, we usually expect the timing of a web session to be between 15 – 30 minutes, allowing us sufficient time to change several significant features on your website. We correct our mistakes at our own expense. If my website seems okay then why should I want to change it? You will be surprised to know that by not checking your website’s performance on a regular basis, you will not know if it’s achieving its aims. With our analytic data collection, we can identify your goals and implement them on session 1. How soon can I get started? Right away. 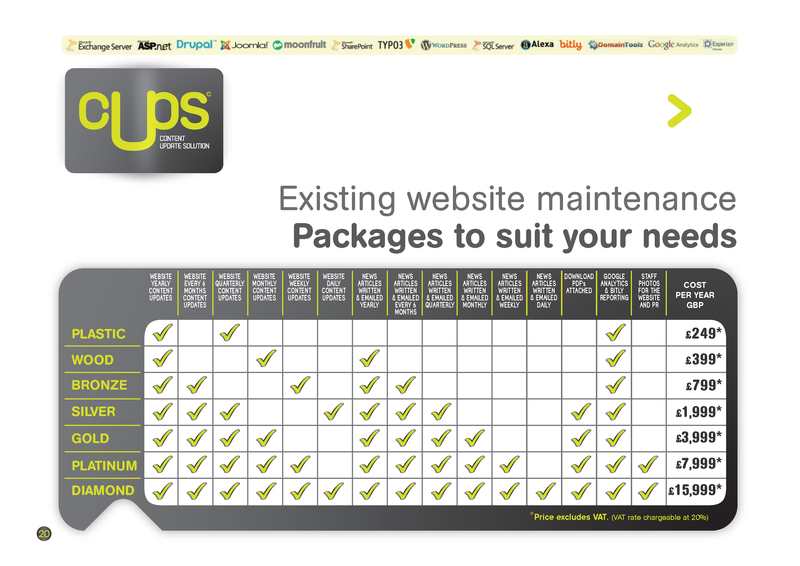 Just select a suitable CUPS package and email us your requirements for some existing website maintenance today.